Discontinued Sorry, the manufacturer is out ofbusiness.Why are there no parts? About 10 years ago Suzanne Somers ran infomercials for this item. Once the infomercials were over the product lifecycle was over and the item was discontinued altogether. There are no replacement bands, rollers, or parts whatsoever and have not been for many years. To our knowledge there is nobody that carries a part that works with this machine. If you happen to find a company that carries parts please let us know. 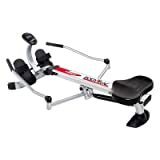 See More GreatExercise Equipment! Fitness Essentials went out of business. This product is no longer available. Product: TerraStar 7505 Suzanne Somers Bodyrow XL 200"! Rowing Exercise Machine Body Row. Nationally recognized television star and well known for her health and beauty lifestyle, Suzanne Somers introduces the BODYROW"!. The BODYROW"! is a unique product idea that will help sculpt and tone your body and give you the results your looking for from your aerobics workout with this excellent piece of Suzanne Somers cardio equipment. The Suzanne Somers Body Row XL 200 gives you an aerobic, strength and toning workout all in one! The TerraStar Body Row xl200 exercise machine will help you tone up and burn calories easily and with a fun to do exercise machine. What parts of body work with row machine? While giving you all the benefits of a traditional rowing machine, the Body Row allows you to isolate your upper body, lower body or even work your entire body at the same time. But that is not all, with the provided resistance bands, you can make your exercise workout even more intense by focusing in on muscle building, or leave it at a low resistance for a better toning and cardio exercise. Its a low impact workout, which eases the tension and stress on your joints. And keep track of the distance, calories, burned, timing and speed with the attached electric console. So regardless of your fitness level, Suzanne Sommers row machine is designed to accommodate all levels and goals while using your strength workout equipment. 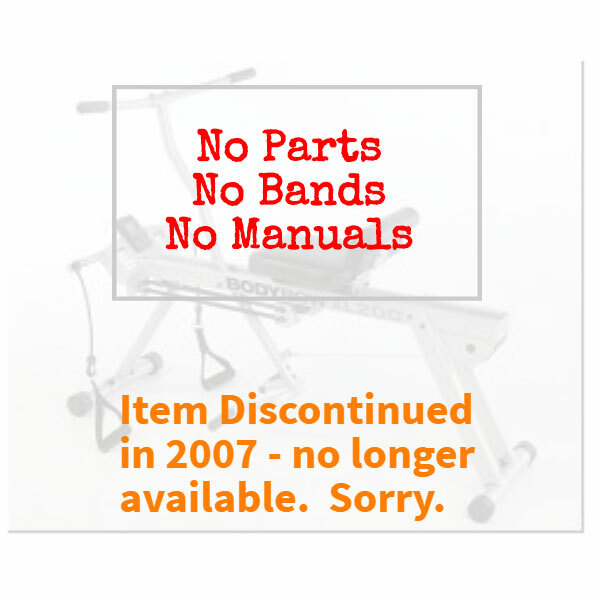 Suzanne Somers Exercise Machine Dimensions are approximately: 52" x 32" x 7" when set up. **Replacement parts for body row machines are best to get from the manufacturer of the Suzanne Summers bodyrow: TerraStar - TerraStar does not have a bodyrow.com website. Fast shipping, excellent rowing machine! Would buy from again! Thanks!!!! I have used this machine and AI loved it. I moved and had nowhere to put my machine so Al gave it to my best friend and now I am looking to purchase another. This is a great way to lose the pounds while having fun working out The body row is a great machine that really works. I will write another view when I received my next machine. I had this machine and lost a lot of weight using it. it was low impact and did the deed. It was a God blessing, the best machine you ever had, please may I get a new one, thank you. Q: Where can I purchase the XL200 machine? A: This Item has been discontinued, meaning that the manufacturer no longer makes it. Q: where can I get replacement bungee bands for my BodyRow XL200 on the parts list they would be four of the #27 and one of the # 52 can you help me to find a supplier that still carries those parts. Thank You. ? A: Unfortunately there are no parts, no manuals, nobody carries it. It is possible you could find a used one on eBay or somewhere. Sorry for the bad news. Q: How much are bungee cords each no. 60 ? A: Unfortunately, this item is obsolete meaning the manufacture has discontinued it. There are no parts or manuals I'm sorry to say. You might be able to find a used one on eBay or somewhere. Q: Why can't I get this machine? Now. please see if you have one somewhere and let me know soon as possible please. it work my whole body please. A: We are sorry but the manufacturer discontinued this. 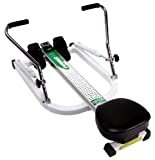 Indoor rowing machine with sliding seat for complete total body workouts. Flywheel design minimizes noise while maximizing a smooth feel. 14-Inch (35.6 cm) seat height, nickel-plated chain and PM3 monitor. Separates easily into two pieces for storage with a quick-release frame lock. Caster wheels make it mobile. Adjustable footrests accommodate a wide range of shoe sizes. Ergonomic handle for natural position. Requires footprint of 9 x 4 feet; 500-pound capacity; 5-year frame warranty.